In large bowl, mix cookie mix, butter and egg with spoon until soft dough forms. Stir in white vanilla baking chips and 1/2 cup of the candies. Press dough in bottom of pan. Sprinkle remaining candies over top. Bake 22 to 24 minutes or until edges are golden brown (center will look soft). Cool completely on cooling rack, about 1 hour. Cut into 6 rows by 4 rows. Store covered in airtight container. If using 21-oz pouch Betty Crocker™ sugar cookie mix, no changes to ingredient amounts or pan size. Bake 24 to 26 minutes. Makes 24 bars. The secret for cutting bars easily is to line the pan with heavy-duty or nonstick foil. To easily line the bottom of the pan, tip upside down and form foil around bottom and sides. Flip pan over, and place foil insert inside pan for a perfect fit! When it's time to cut the bars, just lift the baked bar with the foil out of the pan, and cut. This also makes cleanup extra easy. Drizzle melted white or dark chocolate on bars for some added flair. Customize this cookie bar for any holiday by using other colors of the candies. Colorful, cute and delicious to boot! 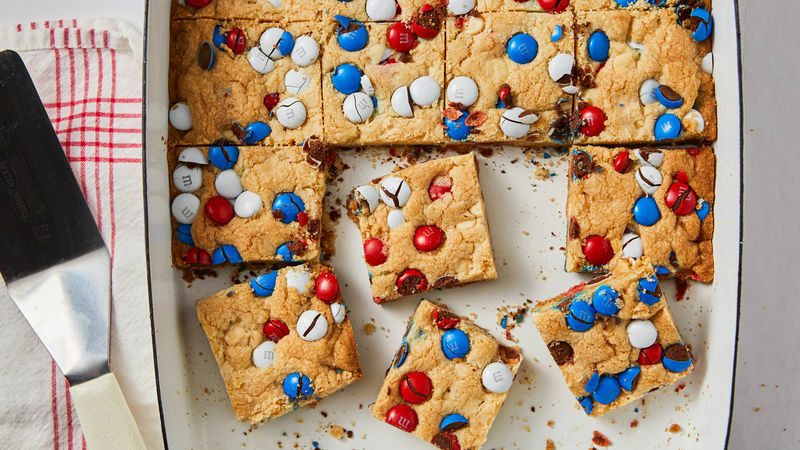 There’s so much to love about these festive Sugar Cookie M&M’s Bars. Thanks to the 10-minute prep time and short ingredient list, you’ll find yourself reaching for this recipe more than once during the holiday season. These sweet bars round out a cookie tray nicely, make a perfect potluck dessert and they’re bound to be winners at the cookie exchange. So don’t forget to stock up on Betty Crocker sugar cookie mix and you’ll be set to bake up a batch of these bars whenever the need arises. And if for you, only scratch will do, there are plenty more sugar cookie recipes where these came from. In fact, Betty’s list of Christmas cookies is long and time-tested, so you can keep baking spirits bright all season long.